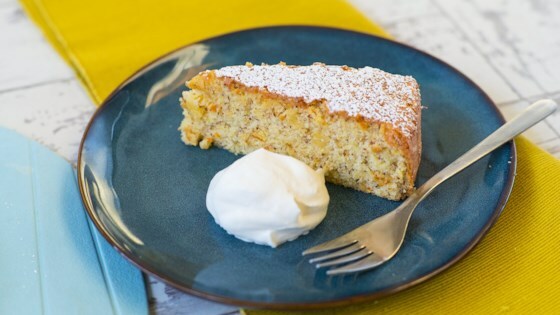 "Semolina and ground almonds give this cake a luxurious weight and the whole oranges provide moisture and a sunny citrus flavor without using any dairy. The cake can be stored in an airtight container for up to 2 days." Preheat oven to 350 degrees F (175 degrees C). Line the bottom and sides of an 8-inch springform pan with parchment paper. You can also chop the boiled oranges by hand. Fiori di Sicilia is a specialty baking ingredient, an extract of citrus and vanilla, available online. In a pinch, skip it and use a total of 1 teaspoon vanilla extract instead. You can also use Amaretto liqueur to flavor the cake. I liked this cake, it was a little dry, but when paired with applesauce it was terrific. When I make it again, I will try something else.